Let's be honest... Broadway isn't where Nashville locals typically hang out. It's always loud, crowded and filled with tourists. However, every once in a while there's nothing better than rallying up the troops for a night out on Broadway. Known as Lower Broad, this famed section of Broadway has attracted country music fans to its honky-tonk bars for decades. Live music can be seen and heard every day and night of the week. If you're heading to Nashville for CMA Fest this week or sometime in the near future, Ashley Houston of Nashville Wifestyles and I have partnered up to help you make the most of your trip. We'll be working on more Nashville guides over the next few months so stay tuned and let us know if you have any requests! MERCHANT'S - Merchant's is by far my favorite place to eat on Broadway. Merchants is a lively three-floor restaurant situated in the heart of downtown Nashville on the corner of Broadway and 4th Avenue. The historic building dates back to 1892. The first floor is a more casual, bistro style restaurant and the second floor is a bit more elevated. We prefer the street-level bistro and a few of our favorite dishes are the arugula salad, the cheeseburger and the pork chop. Their drinks are not to be missed - my personal favorite is the Pimm's Cup. Merchant's makes for a perfect quick lunch spot or a date night out on the town. ACME FEED & SEED - While Acme might be best known for music and nightlife, the first floor of Acme Feed & Seed serves up eclectic southern fare. Stop by Acme for a delicious lunch or a quick dinner before a night out in the town. They also offer a great brunch on Saturday and Sunday. THE SOUTHERN STEAK & OYSTER - The Southern is located just off of Broadway. It is the perfect date night spot and just walking distance from all the downtown nightlife. Featuring an oyster bar, wood-fired grill, local produce and the finest meats... The Southern's menu is southern with a twist and every entree is carefully created. I'm not talking honky tonks just yet people. Here are a few of my favorite things to do during the daytime on Broadway. ERNEST TUBB'S RECORD SHOP - Take a step into the past at Ernest Tubb's Record Shop. It was founded by Grand Ole Opry star Ernest Tubb in 1947 and retains the charm of the past while offering a wide variety of contemporary and classic country music. Skip the Nashville t-shirts and take home a record from Ernest Tubb's as a souvenir instead. JOHNNY CASH MUSEUM - Cameron and I went to the Johnny Cash Museum on my birthday last year and I can't believe it took us that long to check it out. It truly offers an up close glimpse into the personal life of the incredible Johnny Cash. It features the largest and most comprehensive collection of Johnny Cash artifacts and memorabilia in the world. THE RYMAN AUDITORIUM - Tucked right behind Tootsie's on 5th, the Ryman is not to be missed. It is so much more than just a music venue and you can tell as soon as you step foot in the door. It is truly hallowed ground and such a significant place in the city and for country music. COUNTRY MUSIC HALL OF FAME - Known as "the Smithsonian of country music," The Country Music Hall of Fame is not to be missed. The self-guided tour takes about two hours so allow yourself plenty of time to explore. It gives you a whole new appreciation for the city and its dedication to country music. Don't skip out on the RCA Studio B tour - it is Nashville’s oldest surviving recording studio where legends such as Elvis Presley, Dolly Parton and Waylon Jennings have recorded. There's no shortage of fun bars on Broadway. Below are a few of my favorites for a night out on the town. WHISKEY ROW - Dierks Bentley's Whiskey Row has recently become a tried-and-true favorite spot. The historic building is on the corner of Broadway and 4th Avenue and was previously home of Gruhn’s Guitars. Each floor of Whiskey Row has a totally different vibe. The first floor has high top tables and a live music stage. The second floor has a Nashville-meets-Vegas vibe with booth seating, bottle service and a VIP section that overlooks the dance floor. The rooftop is one of my favorites and it's also the highest one on Broadway. Check out more photos in a recent blog post from Whiskey Row here. ACME FEED & SEED - Acme is a Broadway staple. I've celebrated many birthdays and Saturday nights there and it never disappoints. Each of Acme's three levels also has a distinct vibe. What I love most about Acme is the rich history of the building and its connection to the city. FGL HOUSE - On 3rd avenue right off of Broadway, FGL House is always serving up a good time. FGL House features music every day – focusing specifically on today’s country trends. My parents have rented the basement level lounge on several occasions and it's the perfect venue for a large party. It gets crazy on the weekends and is the perfect spot for dancing with friends. CRAZYTOWN - Yep. I love a good Saturday night at Crazytown. If I'm in the mood to dance, you can most likely find me here. There's usually a DJ playing a mix of old school and contemporary music up on the rooftop. OLE RED - I haven't made it to Ole Red just yet (it opened a few weeks ago), but I've heard great things about it. Inspired by Blake Shelton’s song “Ol’ Red,” Ole Red is a restaurant, live music venue and retail space. 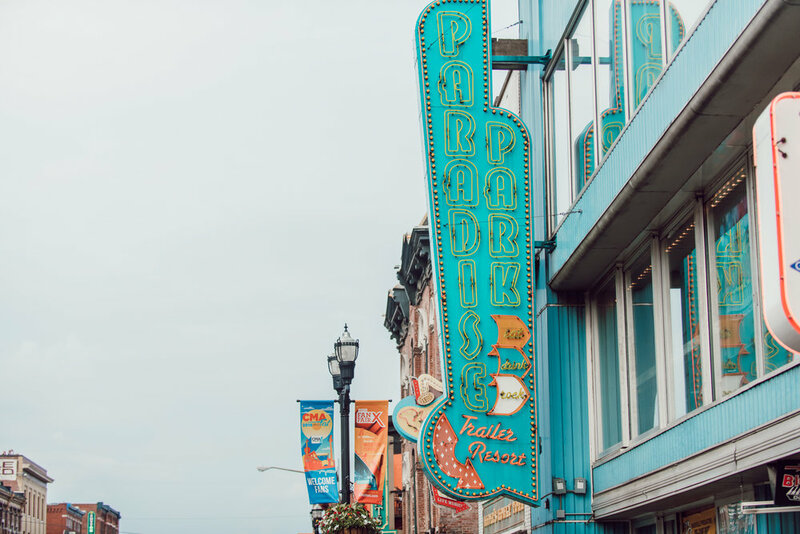 Some will say that a trip to Nashville is never complete without visiting the tried and true honky-tonk saloons along downtown Broadway. I prefer these bars on a weekday to truly experience them. LEGEND'S - Legend's has an unmistakable honky tonk vibe: country music record covers plaster the walls and beer is served cold all night. Located catty-corner from Bridgestone Arena, Legends sits on one of the most prime spots on Broadway. ROBERT'S - Robert's was originally named Rhinestone Western Wear, a western boot and apparel store. The bar still has much of the original southern charm established back in the 1960's. No matter how busy Broadway may be, there's never a cover at Robert's. It's one of my personal favorite honky tonks. TOOTSIE'S - You can't miss the bright purple building that houses Tootsie's Orchid Lounge. Originally named "Mom's," Tootsie Bess bought the honky tonk in 1960. The name came later when a painter painted the lounge purple to her surprise. It's a great spot for live music any night of the week. THE STAGE - You can boot scoot all night long on the big dance floor at The Stage. You never know who will show up to play there and a good time is always guaranteed. PARADISE PARK TRAILER RESORT - Known as simply "Paradise Park," it is probably my favorite late night destination for both greasy eats AND people watching. Paradise Park is best enjoyed when you’re already a few bars in and those greasy cravings begin. My friends and I have decided that calories don't count here. I invite you to adopt the same rule and #treatyoself. LUIGI'S PIZZA - Luigi's serves up fresh slices until 3 am. Their Italian-style pizza dough is handmade and tossed and SO delicious. I hope that answers all of your Broadway questions. More Nashville travel guides coming soon guys, I promise! Leave any requests in the comments below and thank you so much for reading!